Mature cystic teratomas (MCTs) are common benign tumors of the ovary. Coexistence of a carcinoid tumor inside an MCT is extremely rare. We present a 40-year-old woman who had intermittent abdominal pain and urinary frequency. An adnexal mass was detected during physical examination. Ultrasound indicated a 12.3 cm × 10.7 cm left ovarian mass. Surgical excision of the mass was performed, and histopathological examination revealed an MCT with three germ layers. The microcarcinoid tumor arising from an MCT showed a cord to trabecular pattern. The pathological diagnosis was a trabecular carcinoid tumor arising in an MCT. The patient did not present with carcinoid syndrome, and no recurrence was observed after 12 months of follow-up. Mature cystic teratomas (MCTs) are the most common benign tumors in ovary. Malignant transformation of teratomas (TMT) occurs in 1%–3% of all MCTs , usually in postmenopausal women. Squamous cell carcinoma is the most common tumor type. Primary carcinoid tumors of the ovary are relatively rare, representing only 0.3% of all carcinoid tumors and <0.1% of all ovarian cancers . There are four histologic subtypes of carcinoid tumors: insular, trabecular, mucinous and mixed. Compared to other types of carcinoid tumors, trabecular carcinoid tumor has a relatively benign disease course. Clinically, it seldom relates to carcinoid syndrome which typically presents with flushing of arms and face, wheezes, and diarrhea in patients with carcinoid tumors. We present a rare case of a primary trabecular carcinoid tumor arising from a large mature ovarian cystic teratoma in a 40-year-old nulliparous premenopausal woman. A 40-year-old nulliparous woman presented with intermittent abdominal pain and urinary frequency for 2 months. An adnexal mass was located during the physical examination. The woman was with regular menstrual cycle, and she had hyperthyroidism and had no abnormalities in her gynecological history. 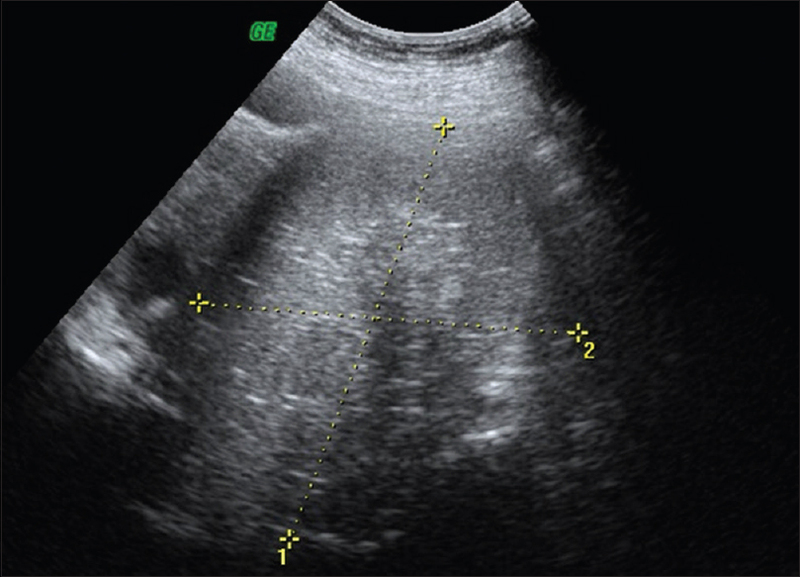 Transabdominal ultrasonography confirmed a 12.3 cm × 10.7 cm cystic mass with hyperechoic lines produced by the presence of hair, within the left ovary [Figure 1]. The tumor markers were as follows: carcinoembryonic antigen, 2.133 ng/mL (reference range <5.0 ng/mL); cancer antigen (CA)-125, 84.5 IU/mL; CA 19-9, 24.931 IU/mL; and AFP 2.646 ng/ml. Laboratory testing revealed no other abnormalities, and chest radiography showed a tortuous aorta but clear lungs. A left salpingo-oophorectomy was performed then. Frozen sections showed an MCT, and thus no other intervention was conducted at the time of the operation. Her postoperative condition was good, and she was discharged without any complications. Macroscopically, the left ovary revealed an 11 cm × 10 cm × 6 cm multicystic mass, [Figure 2]. The cystic cavity was filled with sebaceous material and hair. A solid area with bone formation was present. An 8 cm × 0.8 cm × 0.8 cm segment of the Fallopian tube More Details was attached and was grossly normal. Microscopic examination of frozen sections of the left ovarian mass showed a picture of a carcinoid tumor arising from a mature teratoma composed of mature components including skin, skin appendages, bone, brain tissue, adipose tissue, and smooth muscle. A microcarcinoid tumor (0.3 cm) with uniform tumor cells in a trabecular pattern was found [Figure 2]. 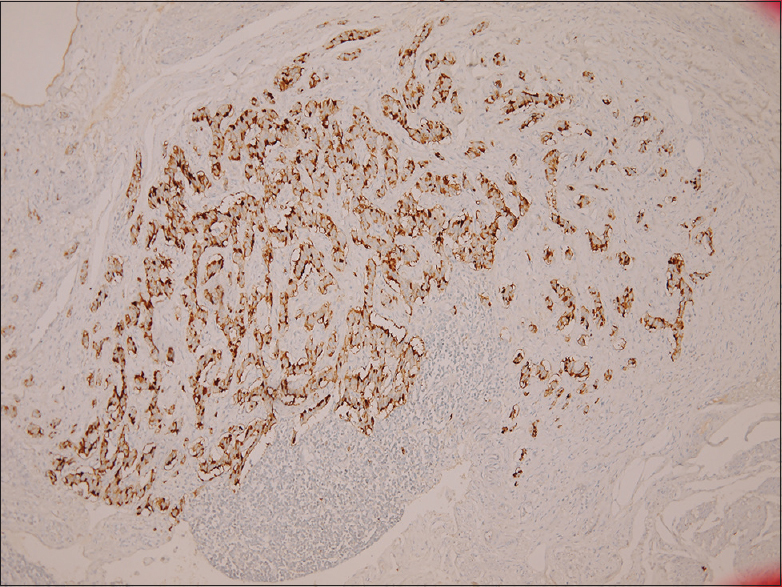 Immunohistochemistry (IHC) showed these tumor cells were positive for chromogranin A [Figure 3] and negative for synaptophysin, and had a low-Ki-67 labeling index (<1%). The section of fallopian tube showed no remarkable change. Based on the morphological and immunohistochemical findings, the tumor was diagnosed as a carcinoid tumor (trabecular type) arising from an MCT. The patient received no further treatment, and no recurrence was observed after 12 months of follow-up. Primary carcinoid tumors of the ovary are very rare, accounting for <0.1% of all ovarian neoplasms. Carcinoid tumors are most commonly found in the gastrointestinal tract, mostly in the ileum and appendix, accounting for approximately 85% of all carcinoid tumors . The second-most common organ for these tumors is the lungs. Ovarian carcinoid tumors are rare and may be primary or metastatic. Primary ovarian carcinoids make up approximately 0.3% of all carcinoid tumors . Microscopically, primary ovarian carcinoids are classified into four types: insular, trabecular, mucinous, and mixed. Among the four types, insular carcinoid tumor is the most common type, and trabecular carcinoid tumor is the second-most common carcinoid tumor (about one-third as common as insular tumors), and it occurs in women between 30 and 70 years of age . However, trabecular carcinoid tumor is not typically associated with carcinoid syndrome and has good prognosis with no tumor-related deaths have been reported . The majority of women with primary ovarian carcinoid tumors are peri- or postmenopausal with symptoms of an enlarging mass, or a mass found incidentally. Relatively rarely, they may also present with abdominal pain, constipation, hirsutism and a pelvic mass . In our case, abdominal pain and urinary frequency were the presenting symptoms due to the large pelvic mass. The preoperative diagnosis of MCT of the ovary is relatively easy due to the radiologic detection of bony tissues including teeth, bones, and cartilage. However, preoperative diagnosis of malignant transformation is very difficult. In most cases, a definitive diagnosis of TMT is confirmed by postoperative pathological findings, and IHC analysis ,. In our case, a small carcinoid tumor was identified in a huge ovarian tumor. It is important to perform a complete section of the tumor. The tumor cells were arranged in a trabecular structure. The IHC study revealed a neuroendocrine origin. The tumor was strongly positive for chromogranin A and negative for synaptophysin and had a low Ki-67 labeling index (<1%). Non-specific tumor markers are used to detect or screen for concomitant malignant transformation of MCTs, especially carcinoid tumors, but CA-125 and CA-19-9 may be elevated in some cases . Aside from surgery, the optimal treatment has not yet been established. Unilateral oophorectomy may be the best approach for nulliparous and young patients with early-stage IA disease for fertility-sparing. Hence, for our patient, a 40-year-old nulliparous premenopausal woman, conservative treatment was performed then. Curling OM, Potsides PN, Hudson CN. Malignant change in benign cystic teratoma of the ovary. Br J Obstet Gynaecol 1979;86:399-402. Abeloff M, Armitage J, Niederhuber J, Kastan M, McKenna W. Clinical oncology. 4th ed. London: Churchill Livingstone; 2008. p. 1290. Gardner GJ, Reidy-Lagunes D, Gehrig PA. Neuroendocrine tumors of the gynecologic tract: A society of gynecologic oncology (SGO) clinical document. Gynecol Oncol 2011;122:190-8. Petousis S, Kalogiannidis I, Margioula-Siarkou C, Traianos A, Miliaras D, Kamparoudis A, et al. Mature ovarian teratoma with carcinoid tumor in a 28-year-old patient. Case Rep Obstet Gynecol 2013;2013:108582. Kim JY. A carcinoid tumor arising from a mature cystic teratoma in a 25-year-old patient: A case study. World J Surg Oncol 2016;14:120.